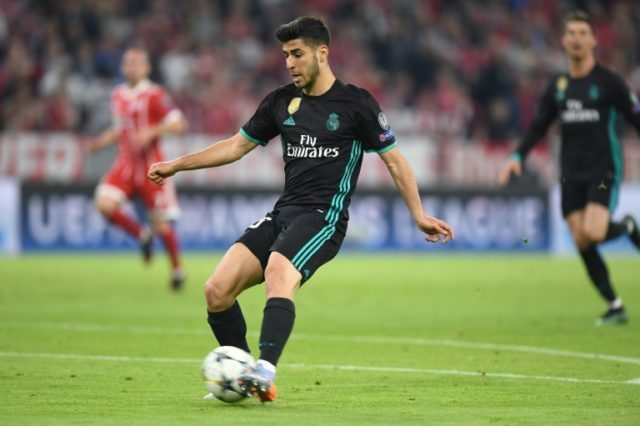 Munich (Germany) (AFP) – Marco Asensio came off the bench to score the winner as Real Madrid claimed a 2-1 first-leg lead over Bayern Munich in their Champions League semi-final on Wednesday. The humiliation of a 4-0 second-leg thrashing at the last-four stage four years ago was the lowest point of Pep Guardiola’s spell in charge at Bayern, while Cristiano Ronaldo scored five over two legs as Real won a thrilling quarter-final last season in extra time. Like 12 months ago, Bayern created plenty of chances against the Real defence, but were made to pay for errors at the back. When Zinedine Zidane reshuffled at half-time, it wasn’t one of the two missing members of ‘BBC’ that he turned to, but Asensio. The youngster scored the crucial winning goal, while Lucas Vazquez provided the assist and excelled on the wing before holding off the dangerous Franck Ribery when switched to right-back after Dani Carvajal’s injury. Marcelo was all over the place defensively at times and was partly at fault for Bayern’s opener, but he has now scored more goals than any other defender in the Champions League knockout stage. His seventh goal in the latter stages was a magnificent strike, adding to his goals against Paris Saint-Germain and Juventus earlier in the campaign. For all the gaps he leaves behind on his raids forwards, the Brazilian more than makes up for it by being one of Real’s most consistent attacking threats. A 3-0 loss to PSG in the group stage saw veteran coach Jupp Heynckes return in place of Carlo Ancelotti in October, but on Wednesday’s evidence, Bayern also need fresh blood on the pitch when Niko Kovac takes over as coach at the end of the season. After Liverpool’s 5-2 victory over Roma on Tuesday saw some horrific defending from the Italians, both Real and Bayern were sloppy at the back and in possession during the second semi-final. Casemiro and Marcelo were caught out of position for Joshua Kimmich’s goal, but goalkeeper Keylor Navas made a terrible error in gambling on the right-back crossing the ball. The two sides were generous in defence at times, with Bayern giving up their hopes of victory on the night with an atrocious pass by Rafinha. If the final is anything like the two last-four first legs this week, fans can expect a host of goals in Kiev on May 26.